The Players regularly receive great reviews for their work, published in local and regional newspapers. all smiles at the end of the show. what” is simply “I don’t know”? good team. I also enjoyed Saal’s performance as the barman, but I felt that his character wasn’t quite a layered as the others. Steffen’s original script felt fresh and contemporary and I found the characters quite relatable. The only problem I had was that there were moments that didn’t ring true. There were small speeches within the dialogue that didn’t quite feel natural. Perhaps a bit of workshopping with the actors could have smoothed out those bits. However, these moments definitely weren’t enough to detract from the overall story. Barry Altwig’s set was beautiful. It genuinely felt like a trendy bar in Cape Town’s CBD. The ambience was also enhanced by the extras – patrons who were hanging out in the bar. They never pulled focus, but stayed in their respective characters throughout. I applaud them all for taking on these silent roles! They added a wonderful depth to the piece. Do yourself a favour and go see this lovely, local gem. 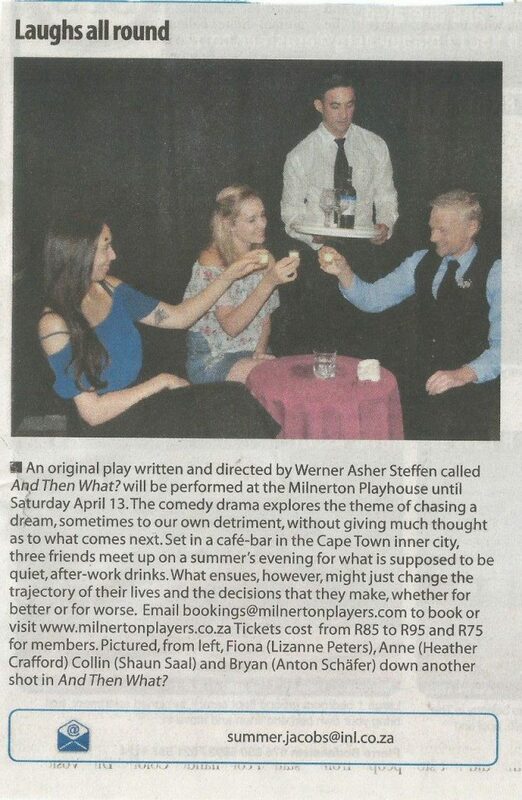 It runs until 13 April on Fridays and Saturdays at the Milnerton Playhouse. Two-act dark comedy by Frederick Stroppel. Directed by Sheila McCormick. Set/lighting: FinMcCormick. Milnerton Players. Until 8 December. Reviewed for Fine Music Radio by Waldo Buckle. Aired on Cape Diary on 30 November 2018. 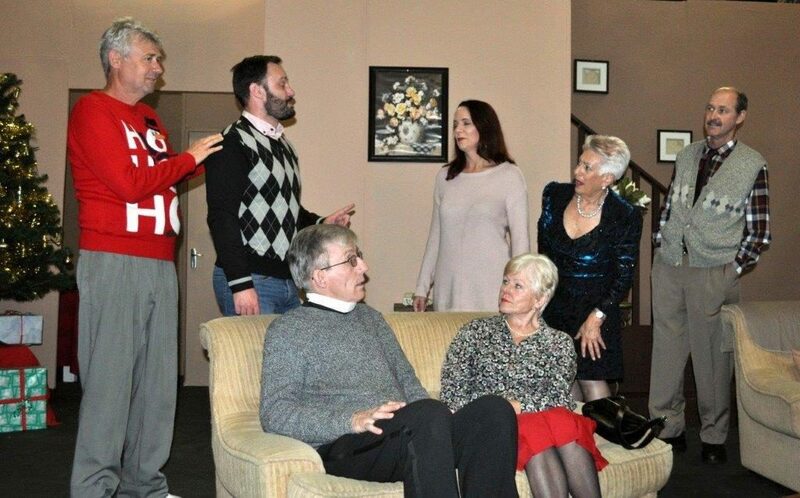 For their end of year production, Milnerton Players has chosen to stage Frederick Stroppel’s dark comedy, The Christmas Spirit. It is Directed by Sheila McCormick, with Set and Lighting design by Fin McCormick and Sound design by Laura Singh. Julia Dowling, played by Beryl Eichenberger, is about to die, at least to the mysterious stranger who appears from behind her Christmas Tree on Christmas Eve. But for Julia, 72 Christmases aren’t nearly enough, and she convinces Death, played by Simon Speck, to grant her a one day reprieve by inviting him to dinner with her friends and family. But the Dowlings aren’t the happy clan Julia leads Death to believe. As the day progresses, old resentments surface, new connections are made, and everyone, even Death, donning a traditional Christmas jumper, feels the magic of the Christmas spirit. The show contains many twists and turns that keep the audience entertained. The visit of the Angel of Death on Christmas eve shocks Julia early that morning. She formulates an elaborate Christmas dinner of goose and plum pudding after Death tells her that he was on a first name basis with Charlie Dickens. Julia, who lives with her daughter, Beth, played by Melissa Sanderson, creates this happy family scenario complete with imaginary children and elaborate guest list. The invited guests area Julia’s Catholic Priest, Father John, played by Richard Wade, her sisterRosemary, played by Brigitte Scherz, her husband, Bernie, played by Trevor Joubert, Julia’s sexually confused son, Paul, played by Werner Steffen, and his bimbo girlfriend, Melissa who is Jewish, played by Nakita Allen. Death himself provides the final guest when he brings an uninvited guest with him to dinner. Recent suicide victim, Matthew, played by suitably stern faced Gary Green. What will happen when Death finds out about Julia’s charade? Will he enjoy Christmas so much that he lets her off the hook? Will a catastrophe in Pakistan make any difference? The two leading players are Simon Speck as Death, aka Jack Frost and Beryl Eichenberger as Julia. Speck’s performance is particularly noteworthy. His interpretation of the role as a naive middle aged man seeing Christmas for the very first time is strong and convincing. The many clever comic lines in the repartee between Jack and Julia underlines the fact that this is not a heavy drama. Another strong performance was that of Melissa Sanderson as Beth, Julia’s daughter. Beth can’t understand why her mother wants to celebrate Christmas with a dinner at their home. As she becomes aware of what is happening she joins in the festivities. Sanderson’s performance was convincing. She fully understood the complexity of her character. As much as her mother makes her mad, she ultimately loves her. The interplay between on-stage husband and wife, Bernie and Rosemary, provided ample laughs. Trevor Joubert is a seasoned performer. His interpretation of the slightly dim witted, absent minded Bernie, made him the audience’s sentimental favourite. As a whole my only criticism would be the inconsistent use of accents, and one can easily attribute the lack of pace and energy during certain scenes to opening night jitters. Stroppel’s plot may be a very transparent take on the “Death Takes a Holiday” motif, but his approach to the idea of Death taking human form is original. In turns funny, tragic and deeply poignant, TheChristmas Spirit is a touching look at the things that truly make life worth living. 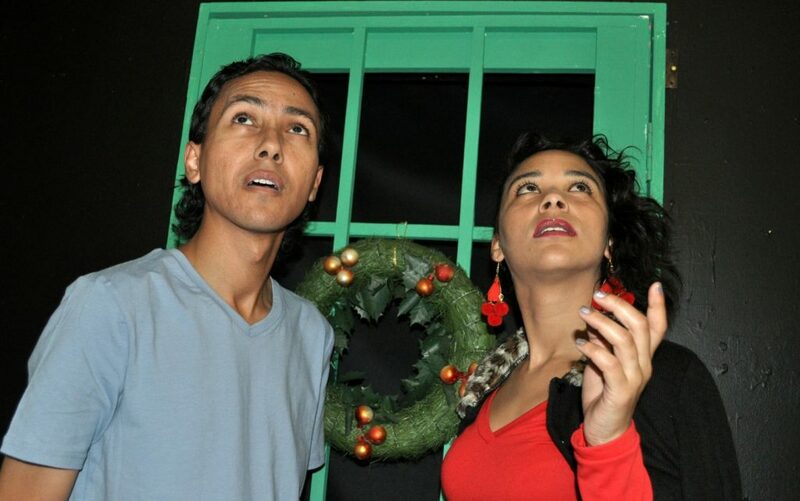 Frederick Stroppel’s The Christmas Spirit, runs until the 8thof December at the Milnerton Playhouse with performances at 20h00 on Fridays and two performances on Saturdays. A matinee at half past two and an evening performance at 8 o’clock. Tickets cost between R75 and R95. 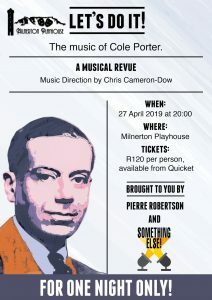 To book tickets please visit www.milnertonplayers.co.za or send an email to bookings@milnertonplayers.com. SHEILA CHISHOLM reviews in the Weekend Special. How would you react if, on your way to bed, you heard a late night news reader mention vast numbers killed in an earthquake in Pakistan; and, as often as you switched off the Christmas tree lights, they flicked on again? Being Christmas Eve, when magical things do happen, you might (fleetingly) think Santa had arrived early to play games with you. 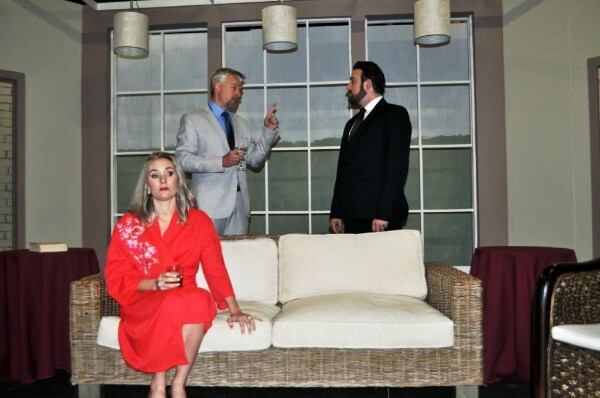 However, if you are feisty Julia Dowling (Beryl Eichenberger) and a tall, gentle-faced, soft spoken man, clad all in white steps into your living room announcing he’s not Santa Claus but Death (Simon Speck) and he’s come for you, you’ll flatly refuse to go. As this sharp reaction stumps Death he calls in young Matthew (Gary Green) to help. Matthew recently committed suicide after his girlfriend broke up with him. And although he’s not unhappy, he now realises that shooting himself over a girl was a stupid thing to do. Julia continues arguing her reasons for not going. She has unfinished business with her daughter Sue who never answers her calls; it would be rude for her family to find her dead before celebrating Christmas together; the children would be disappointed at not receiving their Christmas presents. Besides, the goose needs to be to cooked. Death’s problem is, he has a daily quota of soul gathering to meet. However, when Julia suggests instead of her he adds one unknown earthquake victim, and invites him to Christmas dinner … he agrees. That all may sound rather morbid. But, under Sheila McCormick’s perceptive handling of Frederick Stroppel’s satirical, edgy script the comic rather than the macabre is highlighted. And she’s directed her disciplined cast to bring out, but not exaggerate, typical tensions at family gatherings where personality clashes exist. 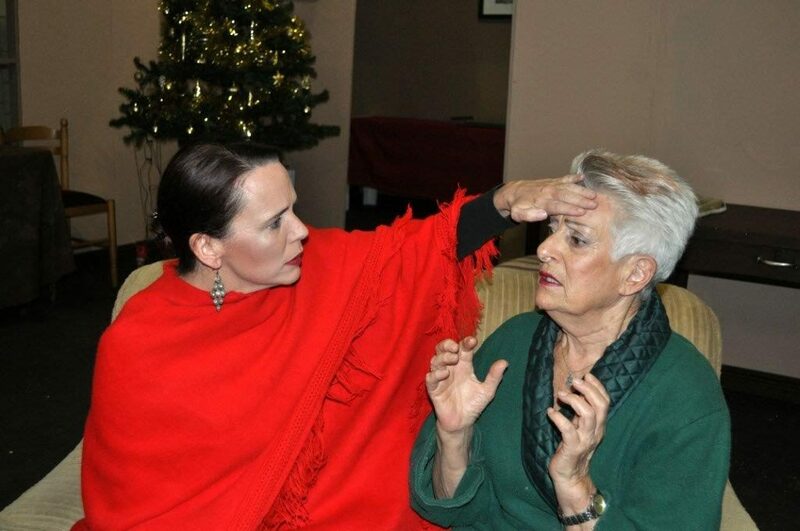 Biggest irritations were fault finding Aunt Rosemary (Brigitte Scherz) and Uncle Bernie (Trevor Joubert), her nerdish, bordering on alcoholic, husband. Under duress they accepted Julia’s surprise invitation. Paul (Werner Steffen) brought Melissa (Nakita Allen) to meet his mother Julia, but the bulimic Melissa spent half her visit flirting withMatthew or running upstairs to the bathroom, leaving Paul a rather lost soul. Father John (Richard Wade), another surprise guest, diplomatically helped smooth ruffled feathers. He even offered himself to Death, in order that Julia could live a little longer. Initially Julia’s beautiful daughter Beth (Melissa Sanderson) couldn’t fathom her mother’s sudden desire to gather all her family for Christmas lunch, as well as inviting “Jack”– a total stranger. When she learnt “Jack’s”mission, she realized how much she loved her mother and did her best to prevent her demise. In her harrowing part Eichenberger sensitively took Julia through the many human emotions anyone facing their sudden departure might feel. A splendid performance worthy of a CATA nomination. Speck playedDeath/Jack as a kindly, loving, all embracing friend, not to be feared. Perhaps that’s the message Stroppel sends in this compassionate story. A Christmas Spirit with a difference. Do see. 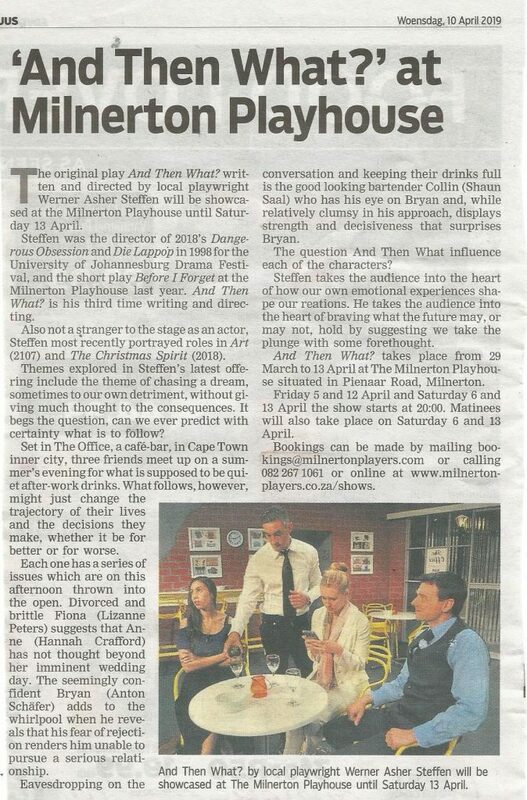 The Milnerton Players have done well to choose NJ Crisp’s thriller Dangerous Obsession to present on the Milnerton Playhouse stage. The setting has been transferred to present-day Cape Town and this works well. 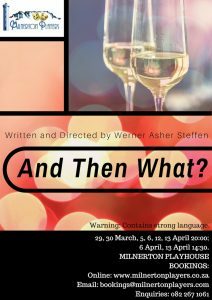 Werner Steffen makes his directorial debut of a full-length play with Crisp’s fascinating story. There are surprises galore as truths are revealed which keep the audience on the edge of their seats. The cast consists of three characters – Sally and Mark Driscoll and John Barrett. 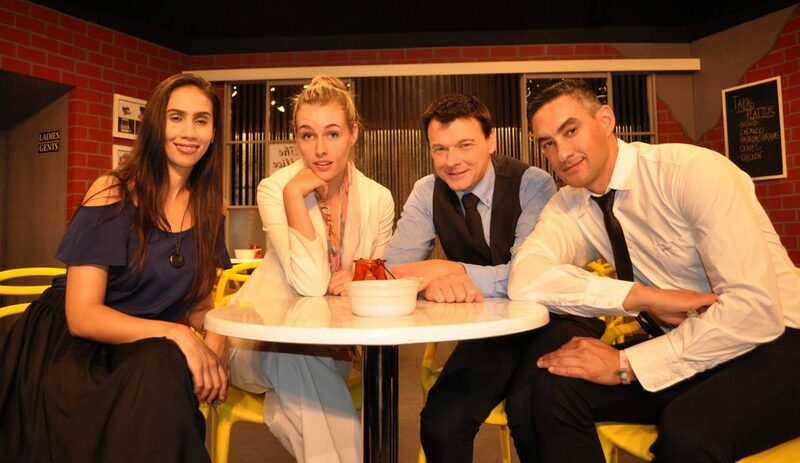 Sally (played byAndrea Fourie) and Mark (Anton Schafer) are a youngish, upwardly-mobile couple. Sally brought money to the marriage and this saved Mark from financial difficulty.They now live in a nouveau riche suburb in an elegant, expensive modern house and are considering starting a family. We first meet Sally in the conservatory, watering her plants and preparing her first evening drink. The arrival of John Barrett (Lee William Speechly) puzzles and alarms her. Eventually she recognizes him as someone that she and Mark had met at a business weekend in Arniston. When Mark arrives from work, he too remembers John and his wife, and shows signs of discomfort. What has John come for? He becomes more and more sinister. Gradually truths are revealed and just when the audience feels that all is now in the open, there are more surprises. Andrea Fourie, as Sally, started a little nervously, pitching her voice a tad high, but she soon settled down and gave a sincere, controlled performance. AntonSchafer, as Mark, suitably downplayed the signs of his discomforture; his break down when the truth confronts his lies was well handled. LeeWilliam Speechly has a good stage presence and is always audible. He was convincingly menacing, but needs to vary his volume, pitch and pace to avoid a certain monotony creeping into his speech delivery. The set of the conservatory was superb – one of the best sets I have ever seen in amateur theatre. Barry Altwig is to be congratulated on the set design and decor. The ceiling to floor curtain was impressive, the doors and windows were sturdy. The glimpse of a fine wall-clock in the next room and the brick wall outside the conservatory door added realism. When the lights went up at the start of the play, there was applause for this beautiful set. The audience was finely entertained as revelation followed revelation. Their enthusiastic applause when the lights finally dimmed was evidence of their enjoyment. The success of Dangerous Obsession should encourage Steffen to continue his career as director. Comedy by Tom Dudzick. Directed by Judith Herbig. Presented by Milnerton Players. At Milnerton Playhouse until 11 August 2018. Somewhere between 1596 and1599 when Shakespeare wrote The Merchant of Venice, the phrase ‘The Truth Will Out’, was born. It’s said mostly under sinister situations, inferring that no matter how many lies a shifty criminal tells, eventually the truth will out … even though it may take years to do so. American playwright Tom Dudzick doesn’t actually use that phrase. He’s simply based his charming, funny, sometimes poignant Miracle on South Division Street around it. To tell what that truth is would ruin the surprises Ruth(ie) (TaniaLemme) reveals to her family before she, and friend Lucy, head off to New York. It is 2010 in Buffalo NY and Ruth is nervously sitting in the family’s 1950’s kitchen with her motherClara (Petra Baker), brother Jim (Thomas van Niekerk) and older sister Beverly(Robin Botha); she’s telling them about her dying grandmother’s last words. These devout Catholics, finding it difficult to believe Ruthie’s story, react according to their nature. Baker, a solid down to earth soul as devoted to honest family values as she is to her religion, gives a brilliant, prize-winning performance. Hers light German accent adds authenticity to her early ‘origins’ as a 1942 Polish immigrant. Van Niekerk is the household’s helpful handyman who’s able to keep his mother’s electrical appliances working long past their expected life span.He’s in love. But apprehensive about his mother’s reaction when he tells her his future wife is Jewish. Completing the family is Beverly. She, like the rest of the family is a devout Catholic. Her job, bottling ketchup (she prefers calling it salad dressing), leaves her with energy to spare which she spends at the bowling alley. Beverly is argumentative. She picks holes in everything everyone says, and is especially critical of Ruthie’s stories. Poor Ruthie, at the brunt of her family’s anguished questioning, somehow succeeds in remaining calm. She, after all, has been privy to her grandmother’s secrets for some time. And that’s all I’m saying about Miracle on South Division Street. Except …warmest congratulations to director Judith Herbig, and her team, for presenting this enchanting play. Fed up with gloom and doom? See A Miracle on South Division Street. Musical Comedy by Dan Goggin. Directed by Kyla Thorburn. Musical direction: Barend van der Westhuizen. 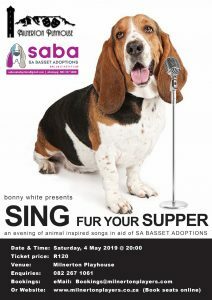 Presented by Milnerton Players. Milnerton Playhouse. Few would believe that the quiet dignity of five nuns, from Holy Cross Convent, could be undone by a simple disaster. After all, these five spent years caring for lepers on a remote South of France island, where serious disasters occurred daily. But Mother Superior, Sister Mary Regina (Fiona Carling), second in command Sister Mary Hubert (Fiona Tanner), streetwise Sister Robert Anne (Melissa Sanderson), befuddled Sister Mary Amnesia (Michelle Galloway) and Novice Sister Mary Leo (Georgina Borros) are in a tizz. This is because they found fifty-two sister nuns dead after eating Sister Julia’s vichyssoise. An unfortunate incident, quite spoiling the quintet’s Bingo evening as now the dead require burial, and funds are non-existent. Trustworthy down-to-earth Sister Mary Regina solves these financial woes by setting up a successful online e-card mailing website – a scheme garnering enough cash to bury 48 of the nuns. As well as purchasing a home entertainment system, and an 85 inch LED TV, bought to assist the mourning process of the five remaining nuns. Nonsense? Yes! But that is what Nunsense is all about … nonsense. Although Dan Goggin’s music is tuneful, no memorable melodies are among the 18 songs sung and danced to Pierre Robertson’s first-rate backing tracks. It’s Goggin’s lyrics and the team’s energetic pizzazz that gives each character their comic identity. Particularly noted is director Kyla Thorburn’s natty choreography and dab hand at drawing amusing characterisations from each personae. 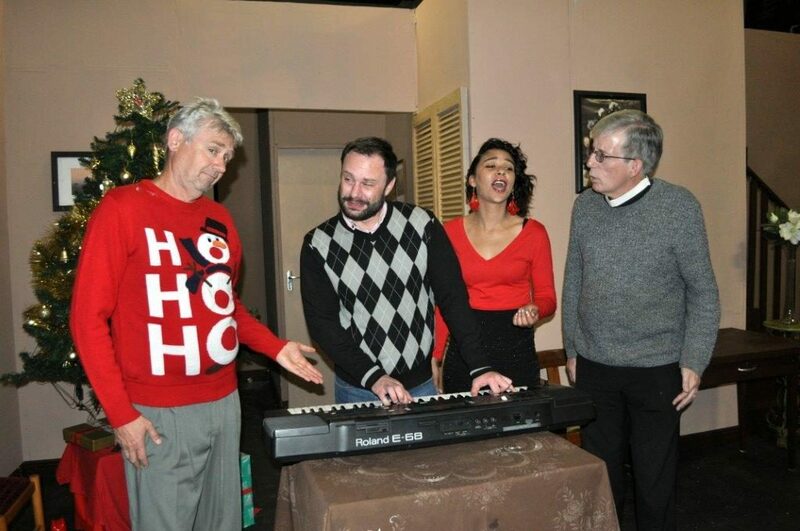 But great credit goes to musical director Barend van der Westhuizen. Without a conductor for cues, he’s rehearsed the crew to such perfection they never miss an entrance, end together and always sing harmoniously. Well, not always. When Sister Amnesia ecomes excited she does occasionally overstretch her vocal cords! Would when people struggle with forgetfulness they could provide as much humour as Galloway – her ventriloquist-mimicking (“So You Want To Be A Nun”) and the disappearance of her amnesia (“I Could’ve Gone to Nashville”) were two highlights. Sanderson’s Sister Robert Anne is a wise-cracking group comic. She can strip the convent car faster than any mechanic and fancies herself as a witch (“Just Wants to be a Star”). Young, fresh and good teammate Burros aims to revive Sister Amnesia’s memory in “Lilacs Bring Back Memories”. Sadly, her ambitions to become the first ever ballerina nun are unlikely to be realised – she’s good but not that good. Tanner – Mistress of the Novices – leads the troupe in Mandy Cardin’s nifty shuffle, step hop tap number, while she and Sister Regina performa jolly duet in “Just a Coupl’a Sisters”.Nunsense is jolly entertainment linked by Carling’s Mother Superior’s tongue-in-cheek, excellently timed, no nonsense approach to convent life. Set in a colourful kindergarten classroom, Hannelore and Philippa van Ryneveld designed authentic habits and follow spot operator Lyle Wilson had fun not following with her follow spot. 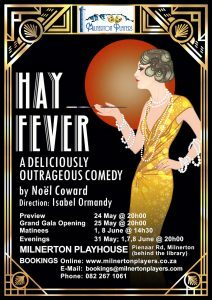 The Milnerton Players’ second production of the year opened at the Milnerton Playhouse on Friday evening. It is the modern French classic”Art” by Yasmina Reza. This wise and intelligent comedy, translated by Christopher Hampton , is set in three apartments of three friends in the Paris of the late 1990s. Anton Schafer makes his directorial debut with this internationally famous play. Serge, a divorced man of fair means, has bought a large, expensive painting, all white, with three just discernable, slightly raised white lines. He proudly shows it to his friend Marc who shocks him by his crude and negative reaction to this modern work of art. Third friend Yvan triesto be conciliatory, but the row just grows more bitter and more personal. As is so often the case in a quarrel hidden resentments surface and the friendship of the three men teeters on destruction. Can the friendship survive? The quirky ending supplies the answer. The three characters are nicely contrasted in speech patterns, gestures and dress. Marc is played by MartinKluge whose continental background adds an extra dimension to his convincing characterization. He successfully conveys Marc’s sophistication and tendency to ‘manage’ others, using his eyes to fine effect. James King as Serge, the proud buyer of the controversial painting, well portrays his defensiveness at Marc’s reactions and the growing estrangement as their disagreement spirals. Werner Steffen is Yvan, tense with preparations for his approaching marriage. His long speech on family disagreements about the wording of the wedding invitation is taken at a rattling pace – almost like a G and Spatter song, as my companion observed. It was rewarded by warm applause. Steffen must, however, guard against a general tendency to rush his speech, which sometimes affects audibility. The white minimalistic set and white furniture, the expert lighting and the Bach unaccompanied cello music all added to the effectiveness of the production. Congratulations here to Barry Altwig, Fin McCormick and Wayne Hendricks. Congratulations also to JennyMerritt for the paintings in Yvan’s and Marc’s apartments. Schafer kept a good pace going, occasionally, I felt, pushing it a little. His three actors worked well as a team; the enthusiastic audience applause at the end was indicative of the play’s success. Schaefer is to be commended for what he has achieved as a first-time director.